Does your horse or foal need a special name? In the space below we have listed some of our favorite horse names. Angus - Angus is the Anglicised form of the Scottish name Aonghas. The name is perhaps best known for the breed of cattle that bears the name Angus (also known as Aberdeen Angus and/or Black Angus). Many people both real and fictional have been named Angus, including the main character on the action-adventure television series "MacGyver" (although his first name was rarely mentioned). MacGyver was highly intelligent, inventive, and always-resourceful. If these characters describe your horse, Angus may be the perfect name. 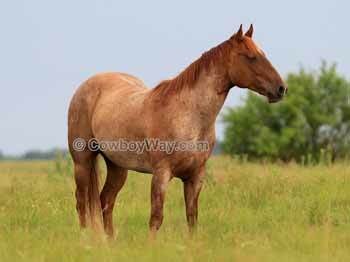 Below: This is Strawberry, a classic name for a red roan horse due, at least in part, to the popularity of the song "Oh, That Strawberry Roan." Argo - The horse of Xena in the television series "Xena, Warrior Princess." Argo was faithful, intelligent, and brave in battle. She also had an uncanny knack for knowing what her mistress Xena was thinking. Arwen - Arwen is a fictional character in J.R.R. Tolkien's novel, "The Lord of the Rings." It is a beautiful Welsh name that means "noble maiden." Atlas - The name Atlas is synonymous with strength thanks to being the name of a super-strong character in Greek mythology famous for bearing the weight of the world on his shoulders. If your horse is strong and has a regal bearing, Atlas may be the name you're looking for. Beau - This name is French in origin, and means handsome, pretty, or beautiful. Originally, it was probably a shortened form of other names such as Beaufort or Beauregard. Although the name Beau was already popular for both people and horses, it had a resurgence in popularity after the release of the 1969 movie "True Grit" where the lead character, played by film superstar John Wayne, calls his horse Beau in the film. Beauty - A classic name for a beautiful horse. Famous horses named Beauty include Black Beauty (from the Anna Sewell novel), and Adam Cartwright's horse on the television show "Bonanza" (1959 - 1973). Beeswax - Beeswax is a substance secreted by honeybees to build their honeycombs. As a name, Beeswax has a fun, playful feel to it. Bella - The name "Bella" is Italian and/or Latin in origin and means "beautiful." It is a very pretty name that is easy to say, easy to remember, and has a lovely sound to it. The name is well known as one of the leading characters in the "Twilight" series of books and subsequent movies. Black Jack (or "Blackjack") - Probably the best known horse named Black Jack was a black gelding of unknown breeding that served in the United States military as a caparisoned (riderless) horse for formal occasions such as funerals. Born in 1947, Black Jack was used in the funeral procession of President John F. Kennedy after he was assassinated in 1963. He also took part in the funerals of Presidents Herbert Hoover and Lyndon Johnson, as well as Five-Star General Douglas MacArthur and countless other funerals at Arlington National Cemetery. In addition, Black Jack has the distinction of being the last horse issued to the United States military and is the last horse to carry the "U S" brand. Black Jack lived to be 29 years old. After he was cremated his ashes were interred at Summerall Field in Ft. Myer, Virginia. His grave has a lovely headstone and is surrounded by an attractive hedge. Below: A photo taken on November 25, 1963. 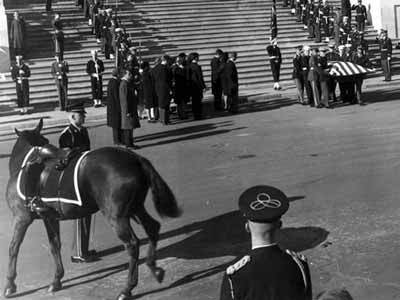 It shows Black Jack and the flag-draped coffin of President John F. Kennedy. Boaz - From the Bible. Since Boaz means "swiftness" in Hebrew this may be the perfect name for a horse that can run fast. Below: This is Ollie, named for the freeze-branded "A" on his right hip: Since his new owners did not know what the "A" actually stood for, they decided it meant "Alleluia" and call him Ollie for short. Boomerang - Boomerang was a famous Irish Sport Horse born in 1966 in Ireland. It's a charming name for any horse. Borak - Arabic for "the lightning." Brownie - In the 1960's a cat named Brownie became very rich when his owner, Dr. William Grier, bequeathed him and his feline friend Hellcat close to $415,000. A third cat, Charlie Chan, received an additional $250,000 all to himself. In the horse world, most horses named "Brownie" get the name because of their brown color. However, Brownie would be a good name for a horse that has had a great windfall of good luck in his past. Burbank - This was the name of Danny Glover's cat in the 1987 movie "Lethal Weapon." It's also a good horse name for a horse that acts like a star. Caboose - This is a cute name derived from the last car on a freight train, known as the "caboose." Because of it's position on a freight train, behind all the other rail cars, the word "Caboose" has become synonymous with "back end." In the episode "Incident Of The Big Blowout" from the television show "Rawhide" (1959 - 1966) trail drover Joe Scarlet says a heartfelt farewell, until the start of the next cattle drive, to a horse in the remuda named Caboose. Scarlet says: "Caboose. Didn't have all the speed in the world, but probably the best swimmin' horse I ever had. Saved my life crossin' the Red" (presumably a reference to the Red River). Caboose is a cute name for any horse, but might be particularly appropriate for a horse that has finished at the back end of something, but still has wonderful, redeeming qualities. Calamity - The word calamity means "great misfortune" or "disaster." This would be a cute name for a horse that has lived through a rough time, or for a horse that has a bit of a wild side. Caleb - From the Bible. Caleb and Joshua were the only two members of the original band of Israelites that fled from Egypt that lived to enter the Promised Land. Caleb is a good, strong, name for a horse that is a survivor. Carbine - A carbine is similar to a rifle but is lighter and shorter, making them popular for use in tight areas and on horseback. Carbine was also a famous racehorse (1885–1914) and sire who was inducted into the New Zealand Racing Hall of Fame and the Australian Racing Hall of Fame. As a name, Carbine has a powerful, old-west feel to it. Cher Ami - Means "dear friend" in French. In World War I there was a famous homing pigeon named Cher Ami that delivered messages for the United States Army Signal Corps. On her last mission she was struck by enemy fire and severely wounded but still managed to deliver a message that led to the rescue of 194 men trapped behind enemy lines. Army medics saved Cher Ami's life, but one leg had to be replaced with a wooden one. Cher Ami was awarded numerous honors for her service, and upon her death was taxidermied for her final resting place in the Smithsonian Institution. Up until she was taxidermied Cher Ami was thought to have been a male, but during the taxidermy procedure was discovered to actually be female. If your horse is brave and selfless Cher Ami may be the perfect name. Chico - Chico is Spanish for "boy" or "lad." As a name it is cute, unpretentious, and easy to remember. Chico was the name of one of the two main characters in the television series "Chico And The Man" (1974 - 1978), and also the name of the horse belonging to the queen in the television series "Queen of Swords" (2000 - 2001). Cinch - From the Spanish word "cincha." 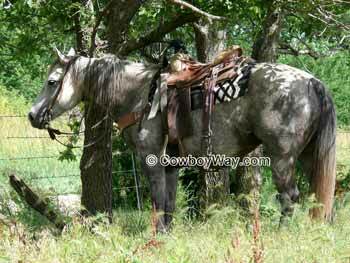 A cinch is a saddle girth, the strap under the horse's belly that helps hold the saddle on. The word "cinch" can also be a casual or slang expression meaning something that's easy to do, as in "Oh, that's a cinch." As a name Cinch is short, pleasant and easy to say. Cisco - The name Cisco is of Spanish origin. While "Cisco," on its own, has been around long enough to be considered its own name, it was originally the diminutive or familiar form of the name "Francisco." The Cisco Kid was a well-known fictional character in a wide range of varying stories, movies, and television shows. "Cisco" can also be associated with St. Francis of Assisi, a well-known saint best known to some as the patron saint of animals. "Cisco" is a short, pleasant sounding name that has long been associated with action, adventure, and a love of animals. Cochise - Cochise (which means "firewood" or "hardwood" depending on the source) is a well-known Chiricahua Apache Indian chief famous for defending his homelands against invasion by settlers. He is often described as a tall, powerfully built man with a Roman nose and great dignity. The television character Joe Cartwright (from the television series "Bonanza," 1959 - 1973) rode a black and white horse named Cochise. Cole - This name is of English and French origin, and means "coal black," "charcoal," or "swarthy." Cole is a descriptive name for a black horse, or a good name for any horse whose owner wants a short, simple, attractive name. Famous people with the first name Cole have included composer/songwriter Cole Porter (1891 - 1964), and the outlaw Cole Younger (1844 - 1916) who was famous for being a member of the James-Younger gang. Coley - This is a variation of the name "Cole" and means the same thing: "coal black," "charcoal," or "swarthy." Comanche - The only survivor of the Battle of the Little Bighorn in 1876 was a bay horse named Comanche. He was found two days after the battle, severely wounded. He was treated for his wounds and retired from military duty, although he was occasionally led, without a rider, during formal military occasions. He lived to be approximately 29 years old, living until 1891. Below: This gray mare is Lizzie, named for Lizzie Johnson (1840-1924), a pioneering Texas woman who accompanied her own cattle on a drive up the Chisholm Trail. Cyrus - From the Bible. Cyrus was the name of the king who conquered Babylon at the time many Israelites had been exiled there. King Cyrus allowed the Israelites to return to their native land, so this might be a good horse name if you have a powerful horse with a kind and understanding nature. Digby - A simple, cute, fun name. Perfect for a fun-loving horse with an outgoing personality. Dinah - A short, pretty name. Also the name of the pet cat belonging to Alice in the classic "Alice In Wonderland" book by Lewis Carroll. Eli - From the Bible. Means "height" in Hebrew. If your horse is a daredevil who likes heights, or that can jump well, consider Eli! Elvira - This name is generally considered to be Latin for "truth" but some sources claim it is Spanish where it means "all true." Either way, it's a very pretty name. Elsa - A beautiful name best known for being the name of the lioness in the 1960 book by Joy Adamson, "Born Free: A Lioness Of Two Worlds." The highly successful book told the story of how Joy and her husband George raised the orphaned Elsa and then returned her to the wild. 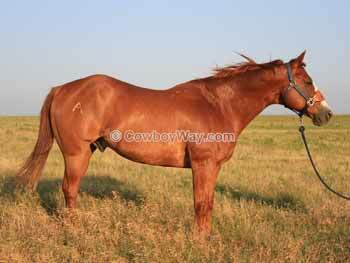 If you have a beautiful mare with a touch of wild in her heart, consider Elsa. Festus - From the Bible, and the well-known television series "Gunsmoke." In the Bible, Festus was a governor of Judea during the time the new Christian church was forming after the death of Jesus. He was considered to be just and respectable. In the TV series, Festus was an ornery, wise-cracking deputy who was also widely regarded to be fair and honest. Of Latin origin, the name Festus means "festive," "joyous," or "happy." Festus is a strong name and an excellent choice for a horse that is a bit ornery, but hard-working and honest. Francis - St. Francis of Assisi is the patron saint of animals, so this is a wonderful name for any animal. "Francis" is a form of the name "Franciso," and so is the even shorter name "Cisco" (see "Cisco," above). Gabriel - In the Bible, Gabriel was one of only two angels to be mentioned by name (the other being Michael). The name is Hebrew in origin, meaning "mighty man of God." Gabriel was the messenger of God. If your horse is swift and strong, Gabriel could be just the right name. You could call him "Gabe" for short. Giles - St. Giles lived from about 1243 to 1263. He was known for his humor, understanding of human nature, and optimism. Giles would be a good name for a horse with a cheerful, playful personality. Below: This Paint mare is War Pony. She has a sweet nature, but she also has an aggressive, all-business personality in the pasture or when there is a job to be done. Gulliver - The name Gulliver may be best recognized as a character from the Jonathan Swift novel, "Gulliver's Travels." In the novel Gulliver visits a land where the people there are very small, making Gulliver a giant by comparison. Gulliver would be a wonderful name for a horse with a big heart. High Pockets - This used to be a common nickname for someone who is tall (and therefore, the pockets on their pants are high off the ground). It has a cute, old-time sound to it and may be just right for a tall equine friend. Hubert - St. Hubert is the Patron Saint of Hunters. This is a good name for a horse that is a hunter or a hunter/jumper, or for a horse used for hunting trips. Ira - From the Bible. Means "watchful" in Hebrew. If your horse is the "watch dog" of the barn or herd, consider Ira. Isabel - Isabel is a beautiful name of Spanish or other origins. It is also very pleasing when shortened to "Izzy" as a nickname. Jingles - The word "jingle" is probably most closely associated with the sound a bell makes, or the sound of spurs. There's also an expression in the ranching world: "Jingle the horses" which means to gather them and bring them in. As a name, Jingles has an upbeat, cheerful feel to it. Kaspar - The name of the black, three foot high wooden cat sculpture at the Savoy Hotel in London that is assigned to eat with any group of diners that have 13 (traditionally believed to be an unlucky number) in their party. It is Kaspar's duty to bring the number of any dining party from 13 to 14, thereby protecting the diners from an unlucky fate. If your horse has ever protected you or brought you luck, consider the name Kaspar. 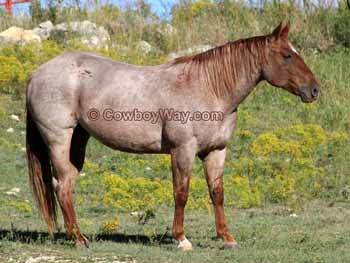 Below: This gelding is named Huckleberry. His owner also owned a horse named Strawberry, so they chose "Huckleberry" because of its similarity. 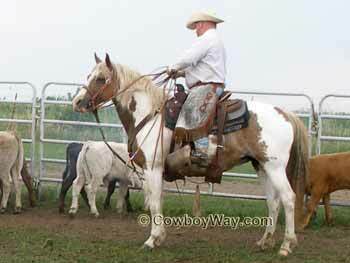 Latigo - A latigo is the strap that is laced through the front cinch to secure a saddle to a horse. The word "latigo" also has a broader meaning, and refers to a type of leather. As a surname, Latigo is found throughout the world, including the United States, although it is not common. As a first name Latigo is occasionally heard as a name for both people and horses, and was used as the name of a comic strip set in the Old West that ran from 1979 to 1983. Levi - In Hebrew, Levi means "attached" or "joined." In America the name is associated with a brand of blue jeans from the Levi Strauss company. Levi Strauss was a real person, a Bavarian-born immigrant who came to America in 1850 and designed a new style of men's pants that evolved into modern day blue jeans. Loco - In Spanish "Loco" means crazy, or insane. It is a fun name for a horse, and doesn't necessarily have to refer to their behavior. Merry - A name of Old English origin, Merry means "joyful" or "lighthearted" and probably first originated as a nickname for a person that had a happy disposition. It is well known as the name of one of the Hobbits in J.R.R. Tolkien's fictional novel "The Lord of the Rings." Merry is often considered to be the most intelligent and perceptive of the Hobbits. Mingo - The Mingo people were part of the Iroquois group of Native Americans. However, the word "Mingo" is probably better recognized as the name of Daniel Boone's best friend from the 1960's television series "Daniel Boone." In the show Mingo was a half-Cherokee, highly educated graduate of Oxford University and Daniel's constant companion. Daniel and Mingo constantly covered rough ground so this may be a good name for a trusty trail horse. Noah - From the Bible. Noah is famous for building the Ark to survive a great flood. The name was derived from a Hebrew word meaning "comfort" so its a great name for a nurturing, loving horse. Phoebe - Probably from a Greek word which meant "light" and/or "pure." Also made famous by the television series "Friends" where the character of Phoebe was sweet and good natured, but ditzy. 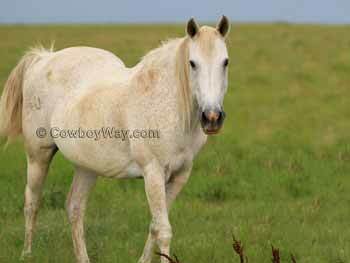 Below: This gray mare is named Peaceful for a horse in the 1950 movie "Fancy Pants" with Bob Hope and Lucille Ball. In the movie Peaceful is the bucking palomino Bob Hope chooses because the horse's name sounds, well...so peaceful. But Peaceful actually got his name for all the people he had tried to lay to rest. Pecos - The word Pecos is probably most closely associated with the Pecos River, a river that flows from New Mexico through west Texas to the Rio Grande River. As a name it is popular throughout the southwestern area of the United States and beyond. In a type of fictional story known as "tall tale" a character named Pecos Bill was a legendary cowboy who performed extraordinary feats like roping a tornado and shooting stars out of the sky. Pilgrim - A pilgrim is someone who takes a long journey, or someone who is a traveler or wanderer in a foreign place. If this description fits your horse, you may have found the right name. Sebastian - Patron Saint of athletes, known for his physical endurance and energy. This would be a terrific horse name for an equine athlete. Shadrach - From the Bible. In the Old Testament the Babylonian King Nebuchadnezzar threw Shadrach, Meshach, and Abednego into a furnace seven times hotter than usual. In a miracle, God rescued all three of the men and they left the furnace unharmed. If your horse has a miraculous survival story, Shadrach may be the perfect horse name! Shiloh - In Hebrew Shiloh means "His gift." Other translations for the word include "he who is to be sent," and "the peaceful one." Spradley - Bill Pickett is a cowboy legend as the man who invented bull dogging, or steer wrestling. Spradley was the name of the horse he was riding the very first time he bull dogged a steer. Sylvester - This name is Latin in origin and means "wooded" or "from the forest." It is also the name of a famous cartoon cat and the first name of the actor Sylvester Stallone, famous for the series of "Rocky" movies. 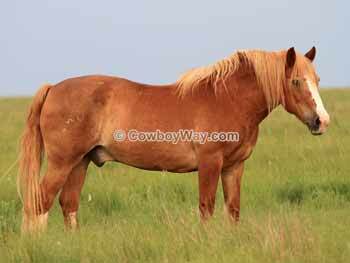 Below: This is Hawg, a half Quarter Horse, half Belgian gelding. The name just seemed to fit his short, extra-wide physique. Tabitha - From the Bible, and the television show "Bewitched" (1964 - 1972). In the New Testament Tabitha was an elderly lady known for doing good and helping the poor. When she died, Peter (aka Simon Peter, better known today as St. Peter), restored her back to life. On the television show "Bewitched," Tabitha was the daughter of Samantha, a good natured witch, and her mortal husband Darin. Titus - From the Bible. In the New Testament Titus was a Greek who became a companion of Paul (who would become St. Paul) and a teacher of early Christian beliefs. Titus is a short, pleasant sounding name and a good choice for a horse that is a good companion. Uri - From the Bible. A short, pretty, name that means "light" in Hebrew. Wiley - This is an Old-English name that means "crafty" or "tricky." It's a cute name and a good choice for a clever horse. Willow - A simple, pleasant sounding name. Willow trees are known for their ability to bend with a strong force instead of breaking. Yogi - The name of Yogi Berra, a famous baseball player, and of Yogi Bear, a cartoon bear. A short, cute, name. Zelda - Zelda is a short, cute name that, as a German name, was originally a shortened version of the name Griselda (which means "dark battle"). It is also a Yiddish name that means "luck." 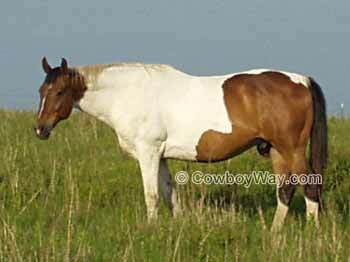 Below: This is a Paint horse named Big Dog. When his new owners first showed the 16 hand tall Big Dog to a friend, the friend exclaimed "He's a big dog!" and the name stuck. For information about a candy bar and a cookie named after horses, please see this page: Candy Named After Horses.